Welcome! New here? Sign up. A star is a celestial body of gases that radiates energy derived from fusion reactions in its interior. The energy from the fusion reactions in the interior of a star is transported to the surface of the star. 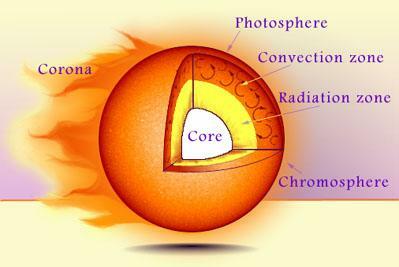 Let's follow the particles of energy - photons - generated in the core from the interior to the surface of the star. First, a photon travels from the fusion core to the the radiation zone, where photons carry energy to the next layer, the convection zone. In the convection zone, gas is heated by the outbound photons, and this hot gas is carried to the visible surface of the star, the photosphere. The visible surface of a star is called the photosphere. The temperature of the photosphere depends on the mass and age of a star. Surface temperatures vary thousands of degrees from star to star. Our sun has a surface temperature of 6,000 C whereas the surface temperature of Rigel, one of the brightest stars in the Orion constellation, is nearly 30,000 C. That's quite a difference. We also observe a large range in luminosity, the amount of energy emitted per time unit, in stars. Luminosity also depends on the mass and age of a star. So, it is not surprising that we find a correlation between luminosity and surface temperature. The table below shows masses, tempertures, and luminosities for some typical stars. Note how more massive stars are more luminous and hotter. This correlation is seen in the Hertzsprung-Russell (HR) Diagram, seen to the right. Right Ascension and Declination are a system of coordinates used in astronomy to determine the location of stars, planets and other objects in the sky. They are similar to the system of latitude and longitude used on Earth. Declination, comparable to latitude, refers to how far above the imaginary 'celestial equator' an object is. It is measured in degrees and, like latitude, is 0 degrees at the equator, +90 degrees at the North Pole, and -90 degrees at the South Pole. Right Ascension, comparable to longitude, being used to locate where on the 'celestial eqautor' an object is. It is measured in terms of hours, minutes, and seconds, with 24 hours representing the 360 degrees of the 'celestial equator'. To understand spectroscopy, we must first discuss the wave nature of light. Light is nature's way of transporting energy through space. Waves carry energy. So we talk about light as a wave. The characteristics of lightwaves include a length of the wave (wavelength), how many lightwaves pass your eye per second (frequency), and speed - in this case the speed of light or 300,000 km/sec. Waves of visible light range from about 350 nanometers (nm) to about 600 nm. We perceive 350 nm lightwaves as the color violet, and 600 nm lightwaves as the color red. You can see the other colors between violet and red as shown below by putting a prism between you and a white light source. Odd thing, though - if you hold a prism up to a red neon sign rather than white light, you will only see a series of orange or red bands, not the entire rainbow of light from violet to red. Or, if you hold a prism between your eye and a sodium streetlight, you will see only a few yellow bands. Each element you look at has its own fingerprints of colors. Some examples are shown below. How does this work? Physicists at the turn of the 20th century asked the same question. The answer led to models of the atom and an understanding of the interaction between energy and matter. 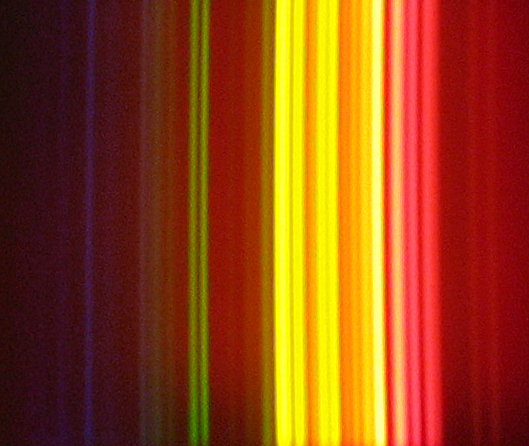 If you put a prism in front of a telescope and point the telescope at the stars, you will see the spectra of the stars! 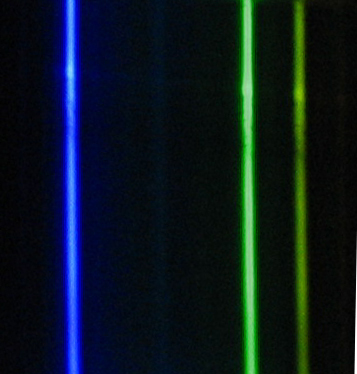 The spectrum of a hot star shows primarily hydrogen absorption lines. 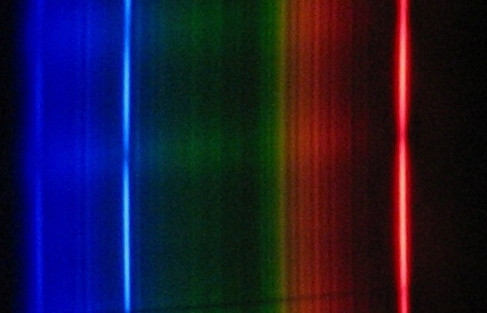 The spectrum of a cooler star shows absorption lines of heavier elements. For example, the spectrum of the star shown below has strong hydrogen absorption lines, which means it is a hot star. The spectrum of another star shown below has very weak hydrogen absorption lines, with other absorption lines due to elements like sodium and iron, and even molecules like titanium oxide. 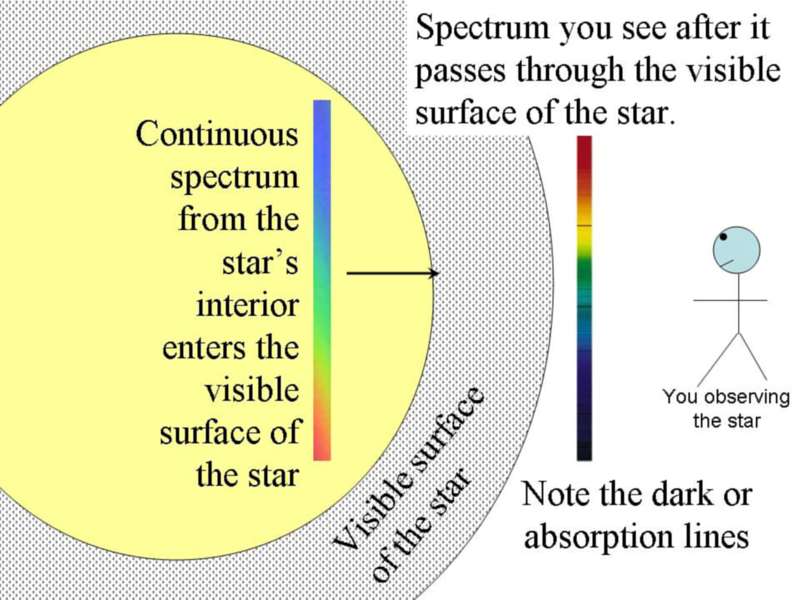 The spectrum of a star is the result of absorption in the outer visible surface of the star. The outer visible surface of a star consists of gases which absorb the continuum of light being emitted from the interior of the star. 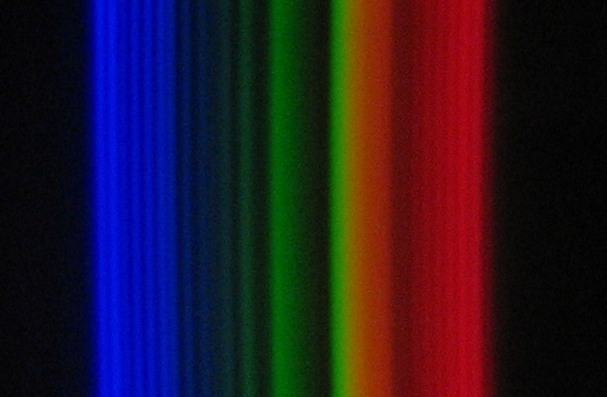 The resulting spectrum is observed as an aborption spectrum. The observed absorption spectrum depends on the composition of gases and surface temperature of the star. The image below shows stars in a 5 degree by 5 degree area of the sky. A prism has been set in front of the telescope when the image was taken. Rather than seeing the star images on the image, you see that each star appears as its spectrum. Each elongated streak is actually the spectrum of a star! Notice that many stars that have similar spectra. These major classifications are subdivided even further. The O type stars are subdivided into O5, O6, O7, O8, and O9. The B, A, F, G, and M classes of stars are subdivided into 10 smaller units: B0 to B9; A0 to A9; F0 to F9; G0 to G9; and M0 to M9. 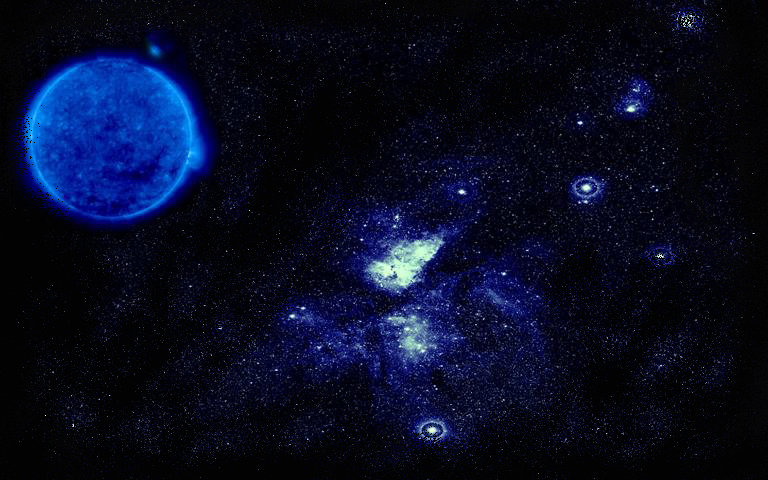 The K class of stars is subdivided into 8 smaller units: K0 through K7. 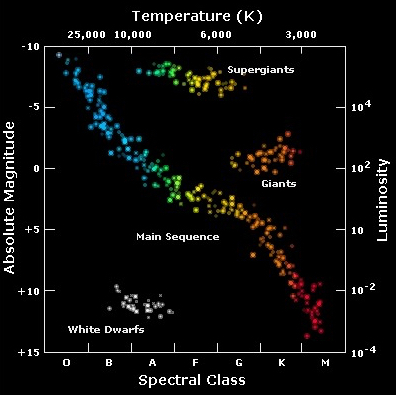 Astronomers also noticed that any particular subclass can be generally either a supergiant, giant, or dwarf star - indicating the amount of luminosity, or size, of the star. These luminosity classes are given the Roman Numerals I (Supergiant), III (Giant), and V (Dwarf). Putting all this together, for example, our Sun is a G2V star, which means it is a cooler (6,000 C), dwarf star. The spectral classifications for several stars are given in the table below, along with the temperature and luminosity of each star. Millions of stars have yet to be classified, and some of these don't fit any class! Be the first to discover the spectrum and nature a star! 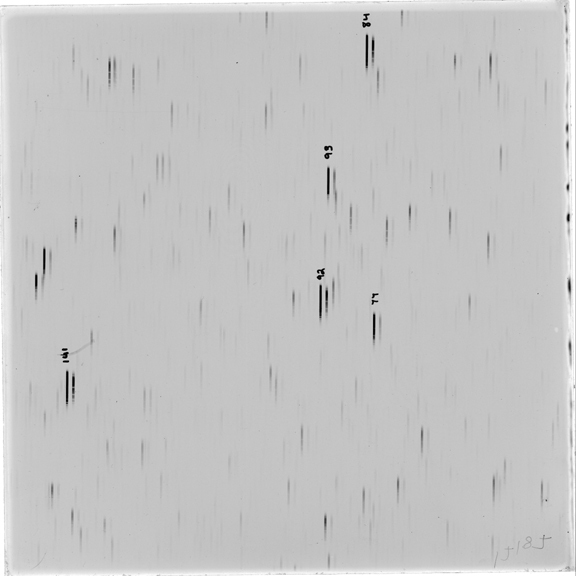 The first program toobtain a spectra of stars began at Harvard College in 1886 under Observatory Director Edward Pickering, who was joined by Annie Jump Cannon in 1896. Their subsequent classification scheme used the letters A to O sequentially, where A stars have the strongest and clearest absorption lines. Later, Cecilia Helena Payne-Gaposchkin demonstrated that the spectral sequence O B A F G K M is actually a sequence in temperature in her thesis "Stellar Atmospheres, A Contribution to the Observational Study of High Temperature in the Reversing Layers of Stars", regarded by some as "undoubtedly the most brilliant Ph.D. thesis ever written in astronomy" (Otto Struve). We use this same classification scheme today. You will be classifying stars from their spectra which have been scanned from photographs of the sky. The photographs cover an area of the sky of 1.25 degrees by 5 degrees, so there are many star spectra on each image, most of which have never been explored before! The photographs are part of the Michigan Objective Prism Blue Survey, directed by Dr. Nancy Houk. The photographs are archived at the Astronomical Photographic Data Archive at the Pisgah Astronomical Research Institute. The photographs were taken with a 0.9 meter Schmidt telescope located at Cerro Tololo Inter-American Observatory near La Serena, Chile. A prism was installed at the front of the telescope to produce spectra of stars at the telescope's focal plane on the photograph. The photograph is a glass plate with blue sensitive emulsion. Most of these plates were taken from the late 1960's to the early 1980's. This program is partially supported with funding from the National Science Foundation, grant DUE 0937824. Copyright Pisgah Astronomical Research Institute. © 2008-2019. All Rights Reserved.